I noticed in your account that YOU made the appointment with the radiologist to do the CT scan. You were proactive. All of us need to be proactive in our own health care. We have to push and push and push when we have that instinct that something is wrong. The doctors are too overwhelmed with the sheer numbers that come through their doors to be able to provide that extra follow up care. I find that even my oncologist, whom I love, doesn’t always have the time to follow up. I have her full attention when I am with her in the office and her staff helps me to make the appointments I need out of the office but she can’t check up and make sure I did what I was told. It’s my body, my health! I have to be the one to do what I need to do. So my point is, being proactive, including following up after a test is how we all need to be to ease our minds. I feel your pain, but have just come to totally expect it, I have numerous chronic conditions and a lot of really awesome doctors whom I love, but their office staff are another issue. I would NEVER EVER count on ANY doctor’s office to call me back – EVER about ANYTHING! Worst experience, a couple years ago I almost died from MAC bacteria in my lungs, never had any respiratory problems before, this is a long story, but the point is after numerous trips to the ER they said I needed to see a Pulmonary doctor, which of course I didn’t had, so I called the practice they recommended that had a GREAT reputation in the area, called a couple times, never got a person on leave a message and they would get back to me, I explained the situation and that I was literally laying on my floor gasping for air thinking it was the end numerous times a day and couldn’t walk from the bedroom to kitchen of a small house without this happening, and it took that office over 2 months to even call me back, and another month to get an appt. Ended up with a great doctor who saved my life but 3 years later I’m sorry to say their office staff has not gotten better and I just realize that if I need them to call me or anything done I better be VERY BOLD and outspoken and DEMAND that I get a call back by the end of the day, and if I’m lucky I might hear from them. Unfortunately that office is really bad, but overall this seems to be the way things go. I’m very glad that you are ok and doing better! As a physician I can say this: I am so sorry. Our job is to develop a relationship with our customer/owners. If we develop that, then we feel their pain, we know their anxiety – and we feel it. Too often we call them “patients” and de-humanized a bit. Too often things happen like this. So, I am sorry – it is the part of healthcare we are trying to change- and have with the Malcolm Baldridge award winning Nuka System of care at SouthCentral Foundation in Alaska. I would mention it to the doctor- I would mention that you had waited for him and you were disappointed, even though you knew the answer. I’m sorry hon that you had to go through that. It’s inexcusable that you had to not only deal with the stress of something like that AND to have to worry about scheduling your own tests and waiting for results. It’s unfair and not your job. But you were proactive. Not a lot of people are like that. They just wait and let things happen which is so scary. I’m glad that it isn’t anything serious. My mom has what you have and we were all sick to our stomachs. 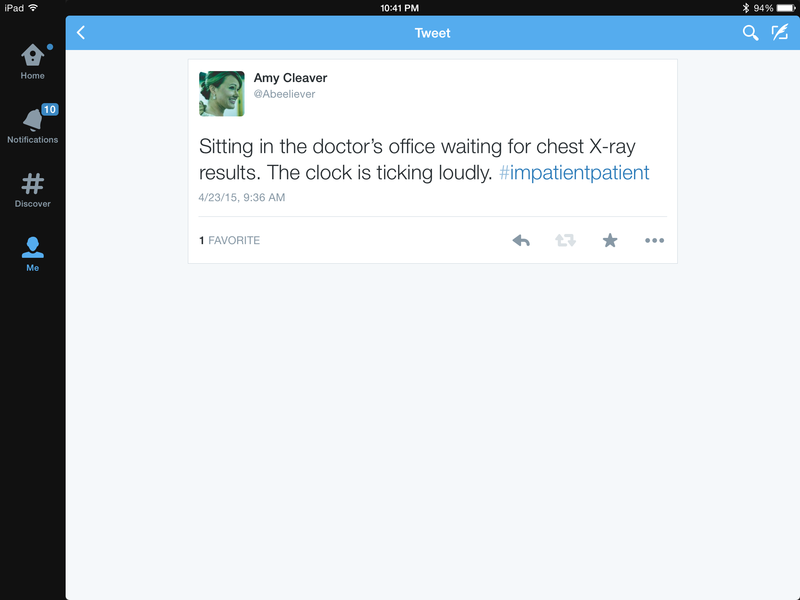 In Canada she had to wait WEEKS for a CT scan, biopsy….it’s awful. Ack! I’m so sorry to hear your mom is going through this! Please try to keep me posted if you can. I can’t imagine having to wait weeks…the anxiety would be so intense. Much love and prayers and gratitude for you and your mama!